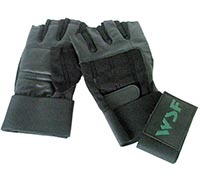 With a padded gripping surface and spandex along the back and between the fingers, the WSF wrist wrap gloves will provide you with both protection and comfort during your workouts. Two Velcro™ wrist closures provides a comfortable fit. Six sizes are available.